AaaaaAAaaaAAAaaAAAAaAAAAA!!! (Force = Mass x Acceleration), shortened for this app review to Aaaaa, is a port of the popular PC game to iOS for iPhone, iPad, and iPod touch from both Dejobaan Games and Owlchemy Labs. 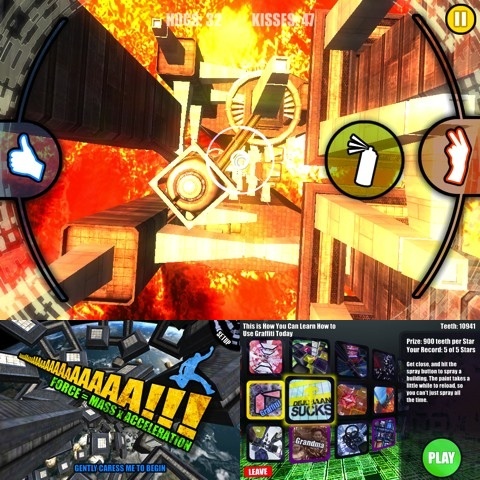 Aaaaa is a score based game; players jump from a very tall building and must successfully navigate through buildings and other obstacles to reach the bottom, earning both a numerical score and a star score from one to five. If you haven’t heard of F=ma yet, you owe it to yourself to grab this game, or at least read this review and watch the gameplay trailer video below to checkout the exciting BASE jumping action. As you descend to the bottom of the level, you’ll find numerous ways to increase your score. These range from staying near the edges of buildings and structures to score plates which, when smashed into, add the total shown on the plate to your score. Additional ways to score points are unlocked the more you play, such as the ability to give a thumbs up or an obscene gesture to any bystander. Unlocking abilities as you play gives you incentive to go back and replay older levels, and you’ll need every ability you can get as getting five stars on each of the 47 levels is a difficult task. Luckily, the difficulty comes from the application itself and not from the controls. Aaaaa uses tilt controls to move your character; generally, motion based controls are a death knell for any iPhone app, but not so here. The physics based gameplay here works perfectly, functioning as well as the original PC version’s control scheme. In an application like Aaaaa, precision control is everything and Dejobaan and Owlchemy Labs delivered in spades. All additional abilities are mapped to on-screen icons, located off to the side away from the action. These icons are responsive and easy to press due to their large size. The graphics in the app version of Aaaaa are identical to the graphics in the PC version. 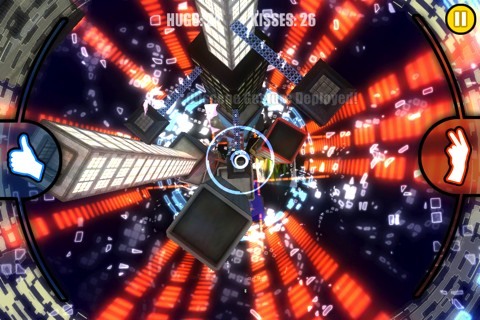 The levels are abstract, with structures and buildings floating in midair, and each level features a different color palette with large uses of purple, yellow, orange and red. Aaaaa also features no slowdown whatsoever, which is good as Aaaaa is very reliant on its sense of speed. The music in the levels is varied but mostly features fast tempos and a heavy reliance on bass, which further increases your adrenaline as you play. Of special note is the humor; Dejobaan Games is well known for its off the wall sense of humor, and this shows throughout in Aaaaa. We played Aaaaa on an iPhone 4 running iOS 5.1 firmware and no problems were present at any time during our review. Aaaaa was an excellent game on the PC and the same can be said of the iPhone application. For a game that was originally released in 2009, a three year hang time to get it on the iOS platform has been well worth the wait. Even though the price is set a bit high at $2.99, Aaaaa F=ma is well worth every penny and is our Featured game of the day. AppSafari review of AaaaaAAaaaAAAaaAAAAaAAAAA!!! (Force = Mass x Acceleration) was written by Joe Seifi on April 30th, 2012 and categorized under Action, App Store, Featured, Games, iPad apps, Physics Based, Universal. Page viewed 5712 times, 8 so far today. Need help on using these apps? Please read the Help Page.